Grosse Abfahrt, in a combination that does appear to include Birget Ulher. Source: sfSound. 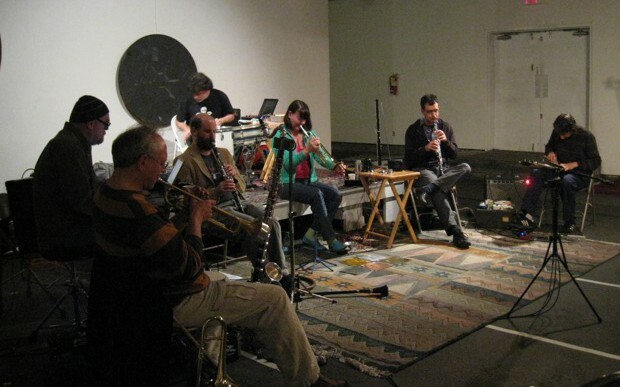 The improv collective Grosse Abfahrt will be convening tonight — Saturday, Sept. 27 — in San Francisco at the Center for New Music. It’s a 7:48 p.m. show that will include out-of-town guest Birget Ulher on trumpet. The general idea is that there’s a core group of GA players, Bay Area residents, who play occasionally and always bring outside guests into the fold, usually creating a largish ensemble of eight to 10. You can read more about the group, and hear a sound sample, in this post from last year. For this year’s show, I thought I’d ask Tom Djll, via email, something that’s been gnawing at me about this group — and about free improv in general, really — for a few years. Namely: If you’ve got a rotating cast of characters, how do you define a group “sound?” Or do you even bother; is it a matter of picking the people you know and trust? There have been at least two occasions where I felt the group sound was so far away from my conception of what it’s supposed to be that I hesitated to call it a “Grosse Abfahrt.” #2 was one of those, which was a live show done at CMC. I don’t remember the year. Sometimes all it takes is for one player to take over to tip the thing over into the zone Where Tom Is Unhappy With the Esthetic. That happened on #2, #5 and #13. #11 was too dense — too many players in a tiny space. Yet on each one of those occasions there were moments and passages of The Sublime. And that’s just my judgement, which is only worth exactly what any other person’s judgement is worth. But, as you say, it is all very much “a matter of trust, knowing that [we] all know each other and have the same general concept in mind.” But just that would be boring. There has to be some disruption from time to time. That’s my specialty! So, as you’d expect with free improv, there’s an element of unpredictability, and it’s up to the players to mold the piece as a whole into the right form. Trumpeter Taylor Ho Bynum is closing out his week’s stay in the Bay Area on his west coast bicycle tour. You’ve got two chances left to see him — in duet with pianist Myra Melford, Fri. Sept. 19 at the Center for New Music; and with clarinetist Ben Goldberg on Sat. Sept. 20 in Palo Alto. Bynum is biking his way from Vancouver to the Mexican border, playing shows along the way. You could think of the whole trip as one extended performance piece. His next stop will be in southern California, where he’s got a couple of dates at the Angel City Jazz Festival the weekend of the 27th. He’s been blogging the trip and posting recordings to Soundcloud. Here’s how it started — with a crash and a sunset. 535 Powell St. Source: Joe Lasqo’s blog. I suppose it’s true that all things must pass, but it’s still sad whenever a music venue gets uprooted for economic reasons. 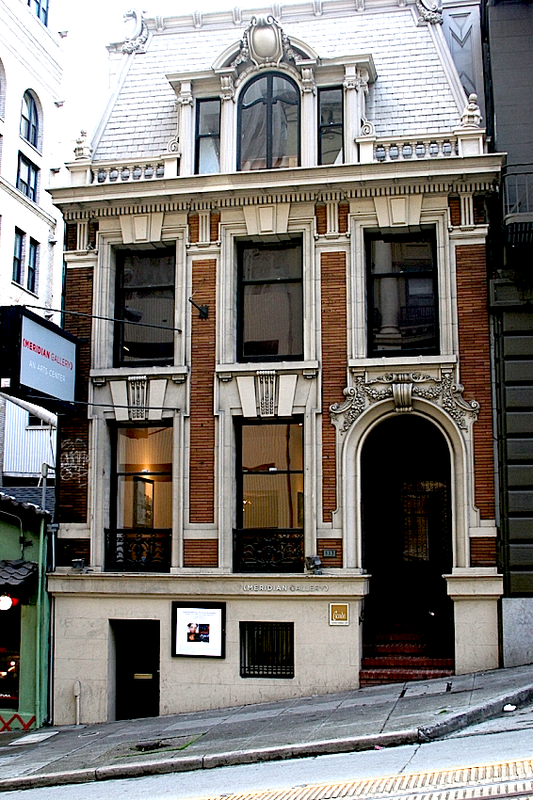 The latest example being Meridian Gallery, which left its Union Square home in San Francisco last week. The gallery’s landlord gave an advance warning of sorts, demanding $100,000 to cover upcoming rent. In pure business terms, Meridian got a fair shake — the gallery could have stayed if it could raise the kind of money that San Francisco’s hyperbolic spiral of rents commands. Of course, it couldn’t. As unfortunate as this is for the visual artists and the musicians whom Meridian supported, the real tragedy might be the loss of a space for its youth arts program, which served the city’s at-risk high schoolers. Meridian, which spent seven years on Powell Street, has moved before and will now move again, but of course, relocation isn’t free. It’s another example of how it costs money to not have money. Many thanks to proprietors Anne Brodzky and Anthony Williams for providing a home for creative music. Some results of those efforts can be heard on the compilation album Earth Music, released in 2011 on the Innova label. Meridian’s home page still shows a “Donate” button, and I’m sure they wouldn’t mind the help. We are witnessing the Late Classic Period of Edmund Welles: The Bass Clarinet Quartet, apparently. You can bear witness to the last days of this period on Sept. 12 when the quartet plays in a bass-clarinet-heavy concert at the Center for New Music in San Francisco. The show includes the bass clarinet duo Sqwonk and a performance of a bass clarinet nonet by Jonathan Russell. If you don’t like the sound of the bass clarinet, this will not be the place to be. As for Edmund Welles’ different eras, bandleader Cornelius Boots lays out the whole chronology on his blog. This wasn’t a decades-long master plan; it’s more that, with benefit of hindsight, he sees the phases of his musical development. 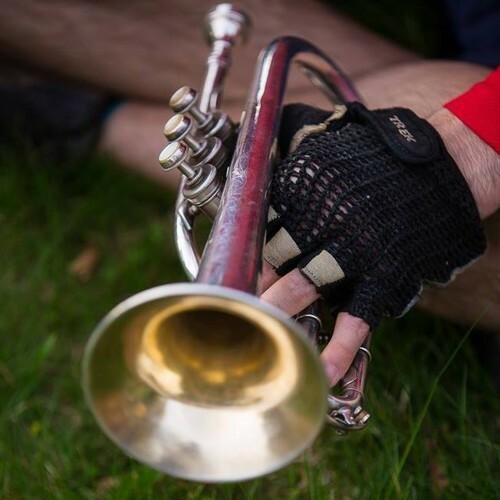 He’s been nurturing the idea of a heavy bass-clarinet band since the late ’90s (the Inspirational Era), developing some songs as part of hard-rock band Magnesium. I got turned on to Edmund Welles during the band’s Early Classic Era, as the album Agrippa’s 3 Books came out, and what I’ve written on this blog has covered the Classic Era and beyond. Boots’ other foci have included teaching — the Edmund Welles album Tooth and Claw now has a companion book that teaches you how to play the songs — and the shakuhachi, the Japanese bamboo flute. He recently recorded a shakuhachi album, Mountain Hermit’s Secret Wisdom, in a cave, exploiting the acoustics to produce meditative pieces such as “Banshiki” — listenable on Bandcamp. The world had better damn well miss Fred Ho. Radical, revolutionary, bandleader, writer, philosophizer — he was a brash, larger-than-life character, the type who doesn’t come into jazz’s orbit much any more. He championed the baritone sax specifically for its loud, unyielding sound. His fight with colorectal cancer, which ended early this year, drew generous platitudes from the media, not for the tragedy of the story but for his inspirational energy and determination. He released CDs and was awarded a Harvard Arts Medal, and he managed to get one final master work onto the stage. The ROVA Saxophone Quartet commissioned a work from Ho, back when. “Beyond Columbus and Capitalism” appeared on The Works (Volume 2) in 1996, and they’ll be revisiting it for a concert Sunday afternoon at the Oakland Asian Cultural Center. The piece plays like a big-band suite, with those same tight horn harmonies and some aggressive swinging rhythms. 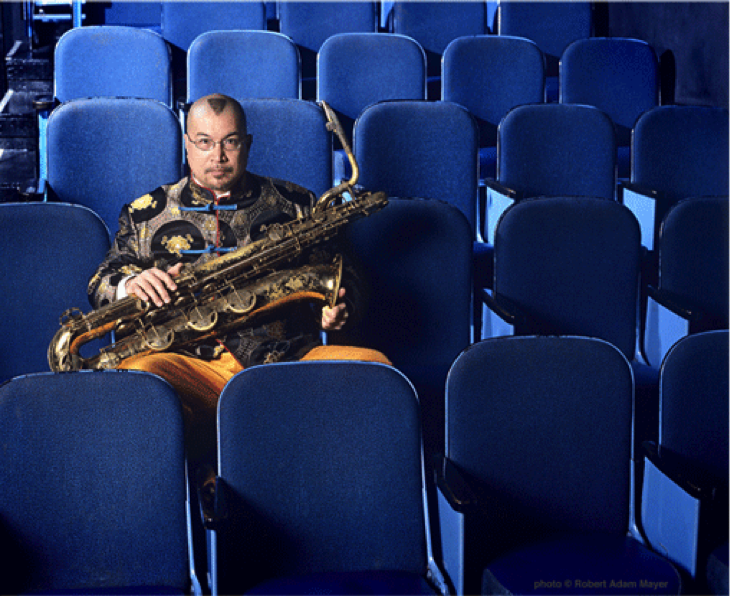 Like most of Ho’s work, it’s a fun ride — and it includes a burly, unaccompanied solo for the baritone sax, of course. For more about Ho, check out his Big Red Media web site (which automatically launches a music player, so be forewarned); an early 2014 NPR interview; a detailed, pre-cancer, 2005 interview for Harvard Magazine, and his elegant obituary in The New York Times. Here’s the info about the concert, cut-and-pasted from ROVA’s mailer. The memorial will feature performance by many of the forward-thinking artists touched by Fred Ho‘s significant cultural contribution. Rova will perform Ho‘s 1992 composition, Beyond Columbus and Capitalism, a work commissioned by Rova through The Meet the Composer / Reader‘s Digest Commissioning Program. Other performers include: Ben Barson, Royal Hartigan, Mark Izu, Jon Jang, Masaru Koga, Genny Lim, Hafez Modirzadeh, John Carlos Perea, Akira Tana, Marty Wehner, Francis Wong, Brenda Wong Aoki, with speaker/emcees: Diane Fujino and Matef Harmachis.